This building is located on Dumbastraße/Bösendorferstraße behind the Hotel Imperial near the Ringstraße boulevard and the Wien River, between Bösendorferstraße and Karlsplatz. However, since Bösendorferstraße is a relatively small street, the building is better known as being between Karlsplatz and Kärntner Ring (part of Ringstraße loop). 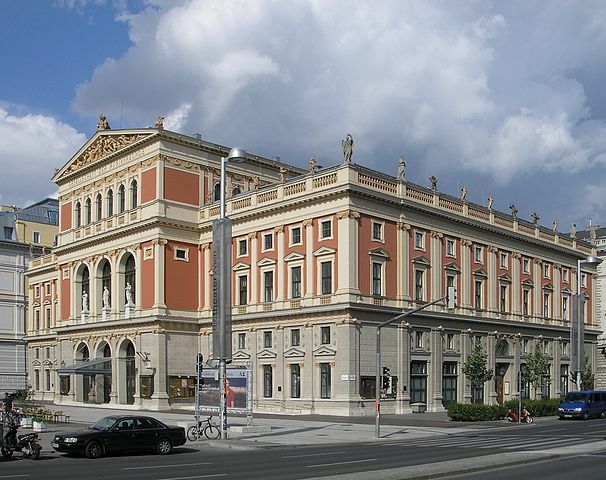 It was erected as the new concert hall run by the Gesellschaft der Musikfreunde, on a piece of land provided by Emperor Franz Joseph I of Austria in 1863. 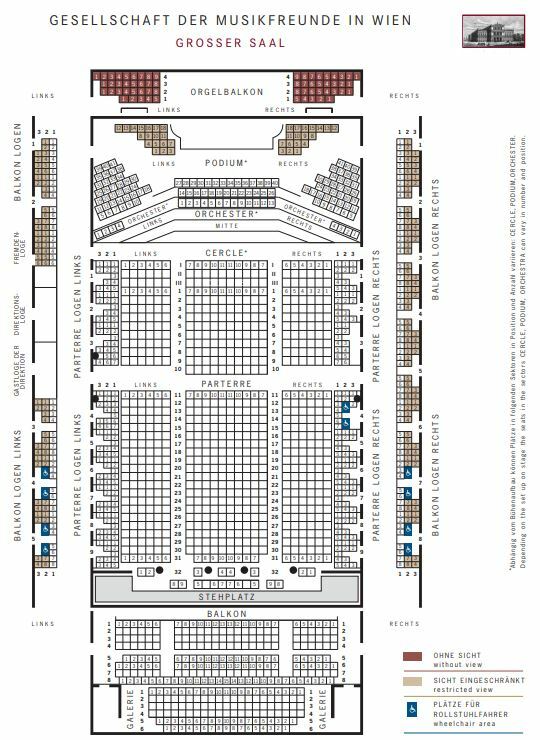 The plans were designed by Danish architect Theophil Hansen in the Neoclassical style of an ancient Greek temple, including a concert hall as well as a smaller chamber music hall. The building was inaugurated on 6 January, 1870. A major donor was Nikolaus Dumba whose name the Austrian government gave to one of the streets surrounding the Musikverein. 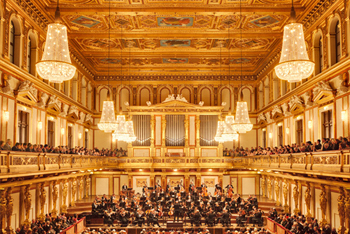 “As high as any expectations could be, they would still be exceeded by the first impression of the hall which displays an architectural beauty and a stylish splendour making it the only one of its kind.” This was the reaction of the press to the opening of the new Musikverein building and the first concert in the Großer Musikvereinssaal on 6 January 1870. 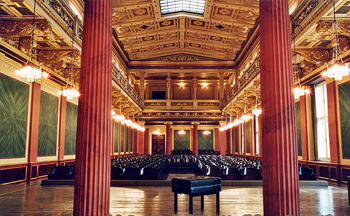 "In order not to promise too much it can be said that it has been made into the most beautiful, most magnificent, perfect example of a chamber concert hall that any of us knows in the world.” This was the reaction of a Vienna daily newspaper in October 1993 as the Brahms-Saal was presented to the public after extensive renovation work. The surprise was perfect. It was a completely new hall. In contrast to the Grosse Musikvereinssaal, the Brahms-Saal had changed its appearance quite considerably over the years. When and how it acquired that slightly melancholy duskiness that was known to music lovers before 1993 cannot be precisely documented. 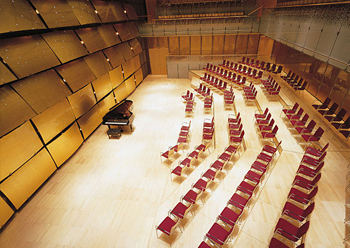 As a venue for events from concerts to luxury banquets, the Glass Hall / Magna Auditorium is not only the largest of the Musikverein's 4 new halls but also the most flexible in terms of usage. Hub podiums enable the smooth transformation of the concert hall into a conference centre, the cinema into a ballroom, or the stage into a catwalk. State-of-the-art equipment for sound, lighting, video and widescreen digital projection provide the ideal conditions for half-scenic productions. The Glass Hall / Magna Auditorium was designed by the Viennese architect Wilhelm Holzbauer. With a height of 8 metres, the hall (including the gallery) can play host to up to 380 visitors.